You can copy the structure of a mind map to the planning. Thereby each node will be transformed into an activity in the planning. This procedure is most suitable when you have created the mind map following the plan-based approach. Which means that the nodes of your mind map correspond to the project phases (Top-Down). 3. Click on Copy to Planning on the Edit tab. A new dialog box will open. Choose between Automatic calculation and Manual calculation to define the start date for the planning. For the manual calculation enter an individual start date. Additionally, you can define the duration for each activity by using work days, hours and minutes. In general, the duration of activities that have been copied from a mind map is the same. 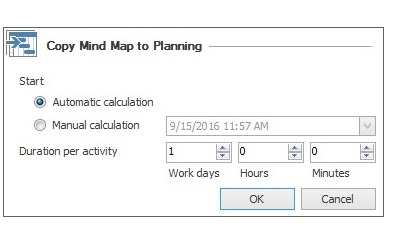 You can customize the duration of activities in the planning. Copy a Mind Map to the planning | InLoox 9 for Outlook • Copyright 1999-2019 © InLoox, Inc. All rights reserved.